.The STS Colloquium Series is not the only way to hear about issues relating to science, technology and society. Please look through the websites of the organizations and centers below to hear about additional lectures and seminars we think you may be interested in attending. The STS initiative partners with several groups on campus to co-sponsor lectures and seminars. All talks are on the UMass Amherst campus unless noted. Copyright has become a terrifying word, as copyright problems have floated into everyone’s daily life. Journalists, bloggers, filmmakers, photographers, librarians, teachers, students and remix artists face daily decisions about how to handle copyrighted material when they use it in their work. Recent research on fair use--the most flexible and ample of exceptions from copyright’s limited monopoly and a free speech right--has reframed the academic and policy discourse around copyright and fair use. Patricia Aufderheide will illustrate this reframing in a discussion of her new book, Reclaiming Fair Use: How to Put Balance Back in Copyright (2011). Aufderheide co-authored the book with Professor Peter Jaszi of the Washington College of Law at American University. Together they head the Fair Use and Free Speech research project at the Center for Social Media. Aufderheide has been a Fulbright and John Simon Guggenheim fellow and has served as a juror at the Sundance Film Festival, among others. She has received numerous journalism and scholarly awards, including the Preservation and Scholarship award in 2006 from the International Documentary Association, a career achievement award in 2008 from the International Digital Media and Arts Association, and the Woman of Vision Award from Women in Film and Video (DC) in 2010. Aufderheide serves on the board of directors of Kartemquin Films, a leading independent social documentary production company, and on the editorial boards of a variety of publications, including Communication Law and Policy and In These Times newspaper. She has served on the board of directors of the Independent Television Service, which produces innovative television programming for underserved audiences under the umbrella of the Corporation for Public Broadcasting, and on the film advisory board of the National Gallery of Art. She received her Ph.D. in history from the University of Minnesota. This talk will kick off Open Access Week (October 24-28), a series of events relevant to open access journal, open conference proceedings, open educational resources, open data, copyright and author rights hosted by UMass Amherst Libraries. Cyberpopulism in Venezuela: “Media war” or “radical democracy” online? Abstract: Most research on political implications of Internet for democracy focuses on how the adoption and use of web tools (i.e. blogs) for political advocacy or e-government contribute to deliberative consensus or polarization in Western liberal democracies. However, as argued by technology and critical media scholars (Cammaerts& Carpentier 2006; Hargittai et al., 2008; Benkler et at, 2010) the critical question from a broader theory of media democracy is how diverse citizens are able to participate and be heard in these spaces. This presentation introduces a larger project that interrogates how social media tools have been used by the state, organized popular actors and citizens in Venezuela, a country that in the last decade has embarked in a democratic but highly contentious transition towards a radical popular democracy. New media initiatives have been part of communication policies that promote the emerging “popular power” and its newly created institutions (Fuentes-Bautista & Gil-Egui, 2010). This project examines the rationale behind, and actual forms of citizen participation enabled by these online projects. The overall project looks at (1) state and citizens discourses in policy debates between 2009 and 2010 about the potential regulation of social media tools; (2) online communication practices and citizen participation in blogs produced by the populist movement, the state, opposition and alternative groups; and (3) media activists’ understandings about the democratic and participatory affordances of online communications. “Cyber-populism” or the symbolic construction of networked communications as a means to strengthen direct, popular governance and participation is proposed as a framework to understand how the state and the popular movement that supports it negotiate their relationship through these policies and initiatives. Preliminary analysis of policy debates on social media use and regulation reveals the symbolic and discursive production of social media as sites of radical democratic governance, and as a “new front” in Venezuela’s“media wars” for the construction of a new Bolivarian hegemony as alternative to capitalism. In these debates, the state and popular movement actors combine discourses on popular communicational sovereignty, administrative efficiencies and counter-hegemonic conflict to promote e-government applications of social media. I discuss the implications of these findings for the promotion of“centralized modes” of citizen participation, and the increasing fractures of Venezuelan public sphere(s). Abstract: In the past twenty years, the Internet has given rise to large networked communities that create and distribute public goods through systems of commons-based production, cooperation, and social exchange. Some well-known examples include Wikipedia, Digg, the SETI@Home distributed computing project; Slashdot; Freecycle; and numerous peer-to-peer file-sharing networks. What kind of role (if any) do institutionalized relations of power and status inequality play in these sorts of online Common-Pool Resource (CPR) production? In this presentation, I argue that institutionalized power inequalities actually drive the production and sharing of informational CPRs. To support this claim, I propose an idealized model of power dynamics in online CPR production rooted in a relational account of inequality. I draw on ethnographic and quantitative data collected from the large, collaborative political blog, Daily Kos (http://dailykos.com). In the context of Daily Kos, numerous interactions between individual participants on the site reproduce radical inequalities of status and influence, which in turn establish and reproduce the foundations of content production on the site. In this way, specifically relational inequalities drive CPR production through mechanisms such as gatekeeping by site elites, status closure, and the boundary work conducted by site participants. Biography: Aaron Shaw is a Ph.D. candidate in the Sociology Department at UC Berkeley. During the 2010-2011 academic year, he is a Research Fellow at the Berkman Center for Internet and Society at Harvard University. Aaron's current research examines the effects of institutional variation in large-scale collaborative production communities online. In particular, he focuses on relations of power within online communities that create and share informational resources. Aaron has also conducted ethnographic research on political movements to promote access to knowledge in Brazil, a project which he plans to continue as part of a broader analysis of the global governance of informational capitalism. Registration required. Visit the workshop website for more information. Abstract: Massive corporate investment around ICTs developed in response to the economic crisis of the 1970s, in a sustained and multifaceted attempt to kick-start accumulation and raise profitability. Three basic components of this more encompassing political-economic strategy included financialization, transnationalization, and (re)commodification. After examining each of these components (the first two briefly), the presentation concludes by asking about the prospect for digital capitalism today, amid a deep and continuing financial and economic crisis: How is geopolitics impinging on information and communications? May we expect this sector to reprise the role it acquired during the late 20th century, in renewing the accumulation process? The lecture is supported by the Department of Communication; CSBS Visitor Support Grant; the Office of Faculty Development's Mutual Mentoring Initiative, funded by The Andrew W. Mellon Foundation; Science, Technology and Society (STS) Initiative; Center for Public Policy and Administration (CPPA); Department of Sociology; Department of Political Science; Department of Economics; the Department of Anthropology; the Social Thought and Political Economy Program; and UMass Amherst Libraries. The 3rd Nanotechnology and Society Workshop organized by the Science, Technology and Society Initiative and the Center for Hierarchical Manufacturing addresses emerging oversight and policymaking systems for regulation and guidance of nanotechnology research, applications, and impacts. Visit the workshop website for more information. This talk will investigate the growing movement of people who have chosen to withdraw from using the Internet and cell phones, and the reasons they opt out of the "information society." The research draws from interviews with the new group of the "unconnected" and examines reasons for their choices on three dimensions; economic principles, social choices, and perceptions of happiness. This talk is co-organized by the Center for Public Policy & Administration's Faculty Colloquium Series and the National Center for Digital Government. ABSTRACT: Collaboration and commerce among organizations increasing rely on sophisticated shared information infrastructures that serve as information or document repositories, communication switches, analytic or transaction processing engines, and social networking sites. If widely adopted and used, informational infrastructures can enable institutional change—changes in the rules, processes, and practices involved in the interactions among the members of organizational communities. Among the relevant prior work, scholars have examined the emergence of technical innovations in organizational communities, the roles of institutional actors in promoting innovation and diffusion, and innovation as the process of creating networks of actors around a proposed change. Less discussed, except in a few domains such as the open source movement and business process standardization, is the community-centered process of creating new formal organizations to coordinate innovation and diffusion. These innovation organizers are distinct legal entities with complex links to the established institutional actors in their communities. They are often collective organizations—member owned and/or governed. Because their activities may combine material production as well as knowledge creation and transfer, their relationships with other community members may involve conflict, and they co-evolve over time with the infrastructures they support. 1:00 – 4:00 Introduction to ATLAS.ti &CAT – A hands-on, computer lab-based training. ABSTRACT: On January 21, 2009, President Obama signed the first memorandum of his presidency, the Memorandum for Heads of Executive Departments and Agencies on Transparency and Open Government. The Memorandum announced the Obama Administration’s commitment to achieving an "unprecedented level of openness in Government." As Deputy Chief Technology Officer, Beth Noveck will discuss the Obama Administration's open government policies and the tenets of transparency, participation and collaboration on which the office operates. BIOGRAPHY: Beth Simone Noveck is the United States Deputy Chief Technology Officer for Open Government. She directs the White House Open Government Initiative at www.whitehouse.gov/open. Dr. Noveck is the author of Wiki Government: How Technology Can Make Government Better, Democracy Stronger, and Citizens More Powerful (2009) and editor of The State of Play: Law, Games and Virtual Worlds (2006). She is on leave as a professor law and director of the Institute for Information Law and Policy at New York Law School and McClatchy visiting professor of communication at Stanford University. Invitation only workshop. The purpose of the meeting is to advance knowledge about the potential and limitations of digital libraries to support sharing knowledge in the domain of ethics in science and engineering. What digital tools, applications and architectures offer promise to increase not only transmission of information but the quality and depth of institutional development? How can the cost of search and navigation through voluminous materials be reduced? What social tools and semantic web frameworks might be useful to incorporate into online resource sites? What are the key limitations of digital libraries and how might these be minimized or overcome? An interdisciplinary conference to look at the use of YouTube in politics. Download the conference proceedings and watch reactions to the conference on YouTube. Bio: Dr. Baxandall oversees policy and strategy development for state PIRGs’ tax and budget campaigns throughout the U.S. He comes to the PIRGs from Harvard University’s John F. Kennedy School of Government where he assisted in directing the Taubman Center for State and Local Government as well as the Rappaport Institute for Greater Boston. In that capacity he assisted the city of Somerville, Massachusetts with performance management and best-practice budgeting, as well as served as a technical advisor for the Massachusetts’ Metropolitan Mayors’ Coalition report on reforming local aid, which was credited for helping to restore local aid funding within the Commonwealth of Massachusetts. Before coming to the Kennedy School, Baxandall worked for the research department of the Federal Reserve Bank of Boston, editing their flagship publication, Regional Review. He also taught political economy for several years at Harvard’s undergraduate honors program in Social Studies, where he won six teaching awards. In 1990-91, he taught economics and organizational behavior at the University of Budapest. In Hungary, Baxandall also worked with an American campaign consulting firm to observe focus groups, formulate survey questions, and prepare national strategy for a major political party in Parliament. 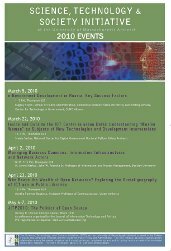 Abstract: Contemporary policies regarding health information technology development, including health information exchanges (HIEs) and personal health records (PHRs), rest on the assumption that lay people care so much about privacy that they are willing to expend the effort to make discrete choices about whether to share specific personal health information with a range of care providers. These assumptions are driven partially by surveys that outline the privacy- and security-related concerns laypeople have regarding sharing their health information electronically. Yet, our empirical investigations reveal something quite different. We engaged 31 patients recruited from a neurology clinic in a realistic decision scenario in which they were given the option to share (or not) information about each of their medications with three physician-types: a primary care physician, a neurologist, and an emergency room physician. We documented participants’ choices along with their understanding of the potential clinical care benefits and information disclosure concerns associated with their specific medication profile. Participants almost universally chose to share all of their medication information with each of the three physician-types, most citing the provided clinical care benefits as their main rationale for doing so. Our study also shows, however, that participants unfortunately did not understand as a whole the possible consequences of their choices. These results are at odds with the common wisdom held by the broader health care delivery and health care information technology communities. While these communities have appropriately recognized laypeople’s privacy- and security-related concerns, current strategies for addressing these concerns – such as those that require laypeople to make discrete choices to electronically share their health information – are not appropriate. The study results also suggest that laypeople exposed to realistic decision scenarios and guided debriefings are likely to reveal their preferences more accurately than when asked to take abstract opinion surveys traditionally used to guide policymaking. Bio: Josh Silver is the executive director and co-founder of the nonpartisan media policy reform organization Free Press. Mr. Silver oversees all programs, campaigns, fundraising and special projects. He previously served as campaign manager for the successful statewide ballot initiative for public funding of elections in Arizona and as the director of development for the cultural arm of the Smithsonian Institution in Washington. He has served as the director of an international youth exchange program and as a development and management consultant. Josh publishes frequently on media, campaign finance and other public policy issues. He attended the University of Grenoble, France, and Evergreen State College in Olympia, Washington. About Free Press: Free Press is a national, nonpartisan organization working to reform the media. Through education, organizing and advocacy, they promote diverse and independent media ownership, strong public media, and universal access to communications. See their website for more information: www.freepress.net. 4-5 p.m. Gunness Student Center Conference Room. Refreshments will be served at 3:45 p.m.
"Mentoring and Persistence among Lower-Income First Generation College Students in STEM"
Bio: Dr. Packard is an expert on mentoring, motivation, and identity. She studies the persistence of women, minorities, and first-generation college students in non-traditional fields such as science and technology fields; how students can maximize their access to mentoring; and how young people from low-income backgrounds, especially urban ethnic minority students, strive to pursue higher education in many forms and participate in science and technology fields. Ultimately, she aims to identify success strategies that support motivation and turn aspirations into realities. This talk is co-sponsored by the Commonwealth Alliance for Information Technology Education. presentation slides [PDF, movie clips are not available] Also see the ASSIST project website for more information. Please join us for a town hall style meeting with the Commissioner of the MA Department of Telecommunications and Cable. This is your chance to find out more about internet and broadband access in western Massachusetts and to ask any questions you may have directly to the Commissioner herself. Stay on campus and join us for a lecture at 1:30 pm, too! (see below). Registration is not required for the Town Hall Meeting, but an RSVP is appreciated. Please email sts@pubpol.umass.edu to RSVP. >>Looking for more information about broadband access in MA? See our broadband page. Bio: Sharon E. Gillett was appointed by Governor Deval Patrick in the spring of 2007 to head the Department of Telecommunications and Cable. 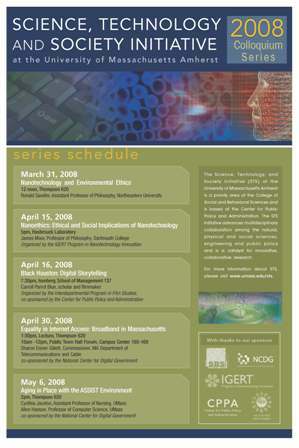 Prior to serving in state government, Commissioner Gillett was a Principal Research Associate at the Massachusetts Institute of Technology (MIT) where she chaired the Broadband Working Group of MIT’s Communications Futures Program and taught courses on telecommunications and Internet policy. She also conducted research on municipal broadband and its economic impact and served on Boston Mayor Thomas Menino’s Wireless Broadband Task Force. Commissioner Gillett received her MBA and MS in Technology and Policy from MIT and her AB in Physics from Harvard University. 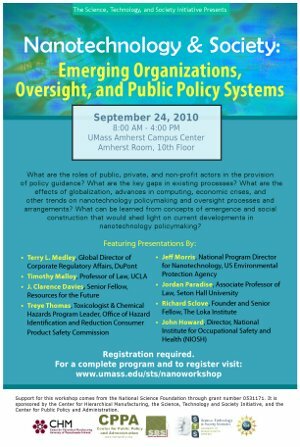 Organized by the Interdepartmental Program in Film Studies and co-sponsored by the UMass Amherst Center for Public Policy & Administration and the Science, Technology & Society Initiative. For more information, please visit the Film program's website. Absract: BLACK HOUSTON: Digital Storytelling Scholar and filmmaker Carroll Parrott Blue will show works from the New Dawn Project, her nonprofit organization dedicated to furthering social change through digital narrative, experimental memoir, and community-based websites, including: The Past, Present & Future of Houston’s Third Ward, a multi-authored community development story from 1840 to 2012; The Emancipation Project; and The Dawn at My Back: Memoir of a Black Texas Upbringing. Abstract: This talk examines the nature of nanoethics and offers a justification for having this new area of research. Some of the hot issues are discussed as well as some suggestions about how to deal with nanotechnological risk. Bio: James Moor is a Professor of Philosophy at Dartmouth College as well as an adjunct professor with The Centre for Applied Philosophy and Public Ethics (Australian National University). He is well-published in the fields of computer ethics, philosophy of artificial intelligence, philosophy of mind, philosophy of science as well as logic. His books include Nanoethics: The Ethical and Social Implications of Nanotechnology (MIT Press, 2007), The Logic Book (McGraw-Hill, 2004), The Turing Test: The Elusive Standard of Artificial Intelligence (Kluwer Academic, 2003), Cyberphilosophy: The Intersection of Computing and Philosophy (Basil Blackwell, 2002), and The Digital Phoenix: How Computers Are Changing Philosophy (Basil Blackwell, 1998). He is an editor of the new journal NanoEthics: Ethics for Technologies that Converge at the Nanoscale as well as Minds and Machines, and he serves on the editorial board for Ethics and Information Technology and Information, Communication & Ethics in Society. Dr. Moor is currently president of the International Society for Ethics and Information Technology (INSEIT) and also affiliated with a number of other professional organizations such as Society for Machines and Mentality, APA Committee on Philosophy and Computers, and many others. Organized by the IGERT Program in Nanotechnology Innovation. Ronald Sandler is an assistant professor of philosophy in the Department of Philosophy and Religion, a researcher in the Nanotechnology and Society Research Group, and a research associate in the Environmental Justice Research Collaborative at Northeastern University. His primary areas of research are environmental ethics, ethics and technology, ethical theory, and Spinoza. He is author of Character and Environment (Columbia University Press) and co-editor of Environmental Justice and Environmentalism: The Social Justice Challenge to the Environmental Movement (MIT Press) and Environmental Virtue Ethics (Rowman and Littlefield). Abstract: The challenges associated with proactive responsible development of emerging nanotechnologies are substantial. Given that nanoscale science and technology are not yet mature and their impacts uncertain, it often is difficult even to identify what the issues are. One way to approach this difficulty is by applying critical perspectives developed in response to previous emerging technologies to nanotechnology. This talk employs several such perspectives from environmental ethics to help to identify and illuminate the social and ethical dimensions of emerging nanotechnologies. 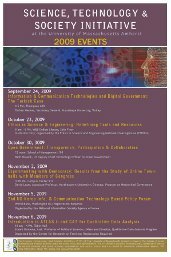 Abstract: How does the development of nanotechnology affect the growth rate of the economy generally? How do economists think about the role of technological innovation in the growth process, of which nanotech is currently one of the most promising components? What does economics as a social science discipline have to say about the proper role of government in the regulation and promotion of innovation? How do patents spur technical change and can they become a barrier? Is the patent system broken and how should it be reformed? What is the role of prizes and competitions? Has the Bayh-Dole Act (1980) accelerated technological change or has it been counterproductive? These and other issues will be discussed by Gibson in the context of the recent trends in the economic impact of nanotechnology. Dr. Manwell will provide an overview of the main policy options used in Europe to accelerate the implementation of Renewable Energy over the past several years. The chief underlying differences of the two main policy approaches, fixed price vs. fixed quota models, will be described and discussed. Special attention will be paid to the German model, which is based on feed-in tariffs and comprehensive zoning laws. Motherhood: The Elephant in the Laboratory is an informative and engaging book for women scientists and career women at all stages of their careers who are balancing career and family or who are contemplating parenthood. The aim of this book is to initiate a national discussion about science, work, and motherhood, by highlighting the unique accomplishments and challenges of women, as scientists and as mothers, with the ultimate goal of redefining the concept of “career” scientist. In this talk, Dr. Jacknis will describe Westchester County government's effort to utilize the World Wide Web in order to reach out to various constituents. His formal presentation will describe recent digital government initiatives in the fields of public safety, emergency management, public health, education, public recreation, and economic development. He will discuss how the web has been used to promote efficient and fair markets, to coordinate between public and non-profit agencies, and to enhance citizen-county communication related to government decision-making processes. Dr. Jacknis will also discuss and entertain questions related to the role of a CIO at his level of government and the policy and management implications of web and other new digital technologies. Registration required. See this website for more information. Registration required. Sponsored by the STS Initiative. See the workshop homepage for more information. The nanotech sector is pushing aggressively with research and innovation, but it is not clear how federal or even state regulators are going to handle any new nanotech products, applications, or side effects. “No regulation is necessary” may be a typical viewpoint within the industry, but is not a likely option if over a century of experience with previous scientific and technological breakthroughs (e.g., inorganic pesticides, genetically modified organisms) is any indication. This talk provides an overview of some of the issues likely to confront state and federal governments as nanotechnology moves from the laboratory to commercial application. Part of the STS Partners Speakers Forum; co-sponsored with the Social and Demographic Research Institute (SADRI) and the Center for Research on Families (CERF). Part technical, part human interest, this talk addresses the challenges, the pleasures, and the opportunities inherent in a cross-disciplinary systems-level research environment that address an important national need and provides an exciting and fertile learning environment for tomorrow’s science and engineering students. ACORN (A CoOperative Resource Network) is an interactive website designed for landowners and others interested in forests in the West and Deerfield River Watersheds in Southern Vermont. This talk will discuss the development of an interactive website to inspire private landowners who have not adopted traditional approaches to forestry assistance and touch on possibilities for cross-boundary cooperation. CLEANER (Collaborative Large-Scale Engineering Analysis Network for Environmental Research), is an NSF project for a novel cyberinfrastructure that facilitates cooperation amongst multi-disciplinarian study of the environment's adaptive response to human activities. One of CLEANER's goals will be to integrate individual models and associated data to create more complex systems that will provide near real-time simulation. The CLEANER project centers on the Blackstone River Watershed, an approximately 454 square mile basin cutting through central Massachusetts and northern Rhode Island.